Offering a fantastic garden with rear access and off-street parking, this stylish three bedroom terrace house benefits from a well-presented interior close to Beckton amenities and Cyprus DLR Station. Renfrew Close is situated close to the green open spaces of Beckton District Park while Gallions Reach Shopping Complex and Canary Wharf are within reach. A little known gem, the Sunborn is a fully functioning hotel held on a yacht next to the ExCel centre. You can go here just for the bar, as well as the half price buffet breakfast at the weekend too! 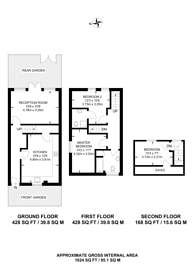 1,024 (95 Sq M) approx.